Enjoy the best prepared and widely varied slopes on the Pizol. 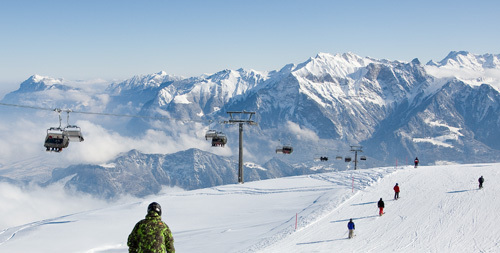 Two modern 8-seater gondola lifts transport winter sports enthusiasts from Bad Ragaz and Wangs directly to the perfectly prepared slopes on the Pizol – only one hour from Zurich or St. Gallen. Skiers and snowboarders share 43 km of certified slopes on the Pizol, which are accessed by eleven chairlifts and ski lifts. One of the highlights is the ultra-modern 6-seater Schwamm chairlift in a Porsche look. 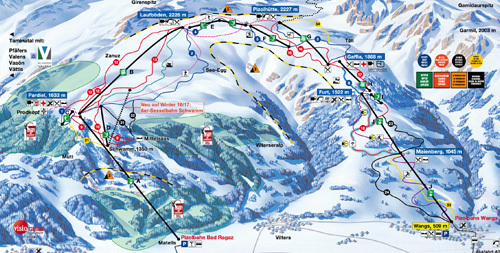 There is also the Riderpark Pizol, the Airboard route and the Panorama mountain trail. – all with a fascinating broad view stretching to Lake Constance. If you want to find out more, the detailed snow report will inform you of the snow condition, the conditions of the slopes and any risk of avalanches.